We laughed and chatted as she went about the process of removing a pint of blood from my arm, focusing mostly on “how can we get more people to do this?” I reflected aloud on the reasons why I give: for me, this is a random act of kindness (I will never meet the person who receives this gift of life) as well as Gratitude practice, a way of giving thanks for my own health. Valerie added a few more great reasons, and from there I made a commitment to share our list. Giving Blood is like an oil change for your body. You clean out some of the gunk in your system and refresh with new blood cells and platelets (the body replaces what’s taken with amazing speed). You get a Free Physical. During the intake process they check your temperature, pulse, blood pressure, and iron levels. You feel great about yourself. Depending on your blood type and current need, your blood may be given whole to save the life of someone who’s bleeding out or enduring a long surgery, or separated into components to help up to eight people, e.g. in treatment for leukemia.I began donating blood in earnest after my little brother died of leukemia nearly 20 years ago, but my motivation for his cause has long since morphed into doing it because it gives me a really good feeling about myself. 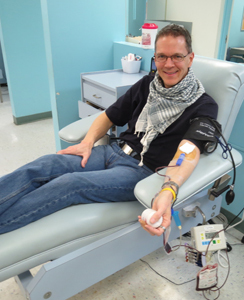 Donating blood is an act of kindness, and Performing Acts of Kindness is one of the top five most powerful strategies for building stronger Positive Emotion muscles. They give you cookies! Or pretzels, granola bars, raisins, whatever. After you donate you get snacks and drinks as a treat (and to help you start to refuel). Ten Minutes of Mindfulness. While you’re on the donor couch there’s nothing for you to do except breathe. You become very aware of your body, your pulse, and the movement of blood in your arteries. You exist only in the present moment. Your brain will love this part. Ohmmm. It gives you an excused absence from manual labor. No heavy lifting for the rest of the day. Nice. You get Happier. Those who staff blood drives as well as those who give are almost universally cheerful people, and one of the easiest ways to upshift your mood is to hang around with other happy, grateful people. The effect of a positive interaction lasts for up to 48 hours! You Pay it Forward. Every time you give of yourself, you put some deposits on account with the Cosmic Bank (what goes around comes around, right?). Some day you or a loved one may need blood, and you’ll be so glad you put something into the system yourself. What’s this got to do with Happiness? First, if I inspire even one person to make a call or sign up for a blood drive, I know it will make a difference to someone in the world. Maybe donating blood is not your thing. OK, so what is your thing? Consider the ways in which you do volunteer your time, money, energy, creativity, or enthusiasm, and remember how great you feel when you do that. Remember the many ways in which giving of yourself comes back to you: at the very least you feel good about yourself, you create happiness in others you help, you pay something forward, you probably (hopefully) get to hang out with others who support you, and you get to make a difference in your community/the world — maybe you even have fun! Every one of those outcomes supports a happier world and a happier you and puts oxygen into your own tank. **Technical Notes: While there are substantial restrictions on who can donate blood, the majority of the population is eligible to give — yet only about 5% of those who can, do. Many people’s objections to donation fall into three buckets: the “ick” factor (fear of needles, faint at blood, etc); the religious factor; and the time factor (takes too long). I understand all of those, and shared some of them myself along the way. If you want to manage the time factor, call 1-800-GIVELIFE and set up an appointment at a local donor center. These facilities take you in and turn you around in one hour. As for the fear/ick factor, just remember it’s all about the story you tell yourself. OK, so maybe when you were 17 you fainted — you’re not that fragile anymore, trust me!